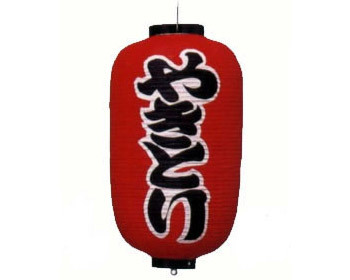 These bright red Japanese chochin, or lanterns, can be seen displayed outside yakitori stalls and restaurants throughout the country. These bright red Japanese chochin, or lanterns, can be seen displayed outside yakitori stalls and restaurants throughout the country. Yakitori, one of Japan's favorite snacks, is chicken skewered on a bamboo stick and barbequed over charcoal. Usually flavored with salt or tare sauce, yakitori is popular throughout the year.